Wisdom of Life. : Star performer always has right attitude. A consensus was done worldwide to find out what are the attributes to make a star performer of a company. They picked the best 100 established international corporations and interviewed their best 5 star performers of each . They finally gathered 30 common attributes that made them special from the rest. 4 are 'Skill' that are 'Attitudes' related. 1 is regarded as a skill alone. Conclusion; if you truly want to be a star performer in your company but lack the above attributes, then most likely you would fail to be one. Unless you change. "The main reason a person achieves, keeps and performs well in a job is totally dependent on his attitude and not only on one's skill alone." 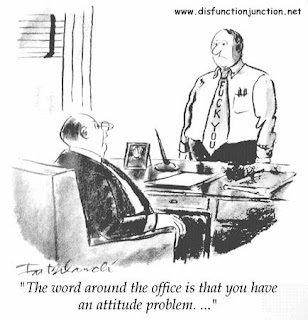 A lot of people think having the right attitude is not as important as the having the skill.. I share the same view as you, Robert.. If I am the boss, I will only hire peoples with the right attitude.. Skill can be developed but attitude cannot be teached.. I was suprised to see humour in the list though but I would agree it is important..